This is not Round Table’s creamy garlic sauce. I don’t think. To be honest, I haven’t had that for quite a while but I used to really like it. Then I started making my own pizzas for the most part. I’ve mostly stuck to a red sauce, marinara, but lately I started really wanting a white sauce so I set out to play a bit and am very happy with the results. None of the variations were bad but some were better than others. 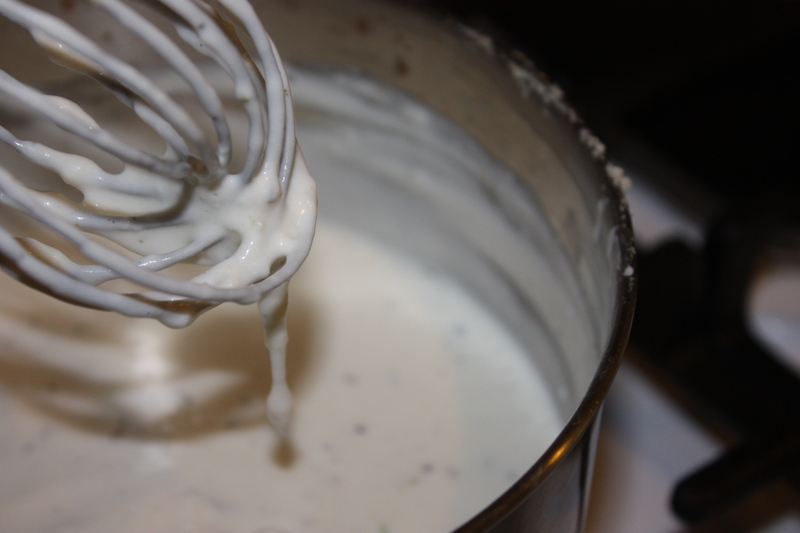 I started with the idea of a basic white sauce. To get the garlic in there, I sautéed chopped garlic in the butter before adding the flour. I played with different dairy products, including whole milk, fat-free half and half, cream and buttermilk. I’d bought the fat-free half and half by mistake. I don’t normally buy fat-free products because I’d rather eat less of something real than more of something fake. It did turn out a good sauce though! But the whole milk was just as good. The real cream is the best, of course, so use that if you’d like or if you have some to use up. The buttermilk was interesting and good. It added a bit of a tang, which was welcome. I’d use it again if I had extra to use up but I don’t think I’d go buy it just for pizza since I always have half and half around for my coffee. I also played around with different herbs, trying for a sort of ranch-like dressing flavor. Fresh parsley, chives and cilantro added a great flavor but if you don’t have fresh, use dried. And if you don’t have dried you can leave them out and still get a good sauce. Initially I just topped the pizza with grated Parmesan but then I started adding it to the sauce and topping the pizza with more. Then I added a bit of grated mozzarella on top of the white sauce. Not a lot, just enough to give a bit of body to the pizza. This was the best! But it’s also good with just the Parmesan. I always make my pizza on a piece of parchment paper and then slide the whole thing onto the preheated pizza stone. After about five minutes, you can lift the paper out and let the pizza finish baking on the stone so you get a good crust. 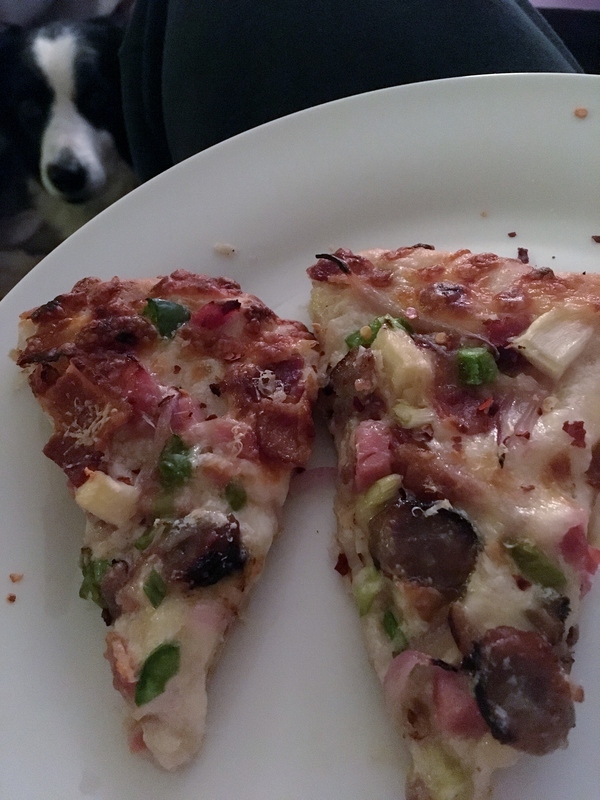 The pizza above was taking advantage of more Easter leftovers: ham, breakfast sausage, bacon and fresh pineapple. I also added sliced red onions and green onions and a discreet pouring of maple syrup! This creamy garlic sauce will add a gourmet touch to your homemade pizzas. a good handful of grated Parmesan 1/2 cup? In a saucepan over medium low heat, melt the butter and add then add the garlic. Cook a few minutes and then stir in the flour. A flat bottomed wooden spoon or a whisk works well for this. Cook the flour and butter over medium heat for a few minutes, stirring most of the time. Whisk or stir in the milk slowly so you don’t get any lumps. Bring to a simmer and cook until thickened a bit. Take off the heat and stir in the Parmesan cheese and herbs, if using. If you’re going for that gourmet veggie type pizza and you have time, grilling the vegetables adds a lot of flavor. 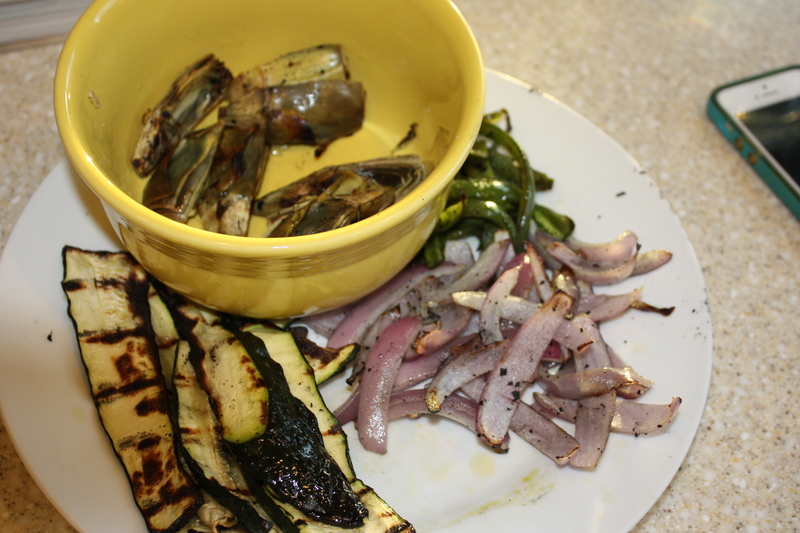 For one pizza, I used grilled artichokes, red onions, jalapenos and zucchini. It was about the best veggie pizza I’ve made! Filed Under: Leftovers, Pizza, Sauces, Dressing, etc.